A couple of weeks back I mentioned that I’d started using the Schwarzkopf BC Fibre Force range, designed to replenish your hair and bring it back to life after years of damage. Having been trying the products out for the last few weeks, and after receiving the BC Fibre Force Micro Infusion treatment on my trip to Boilerhouse, I thought I’d share my thoughts. When it comes to hair care, I wouldn’t say I’m the worst offender. I’ve never dyed my hair, I get it cut every 6-8 weeks and I don’t ever backcomb or have extensions in. Having naturally curly hair though, I do subject it to its fair share of heat damage but I wouldn’t say it was any more than the next person. And honestly, I don’t know many people who wouldn’t complain about the odd split end here and there. So when I heard about Fibre Force, I figured it was worth trying out to see how much my hair condition could be improved. For the last few weeks I’ve used a combination of the BC Fibre Force Cleanser Shampoo (£11.55 for 200ml), and the BC Fibre Force Fortifier Conditioner (£12.75 for 150ml), every other day, so I could really tell whether the products were making that much of a difference. The shampoo cleanses and conditions your hair while the conditioner rebalances your hair’s moisture levels and restores its inner architecture. Since I got back from holiday I’d noticed that my hair and scalp were both extremely dry, despite using hair masks and intense conditioners whilst away. Since I suffer from eczema, I’m used to having dry patches on my scalp, but I noticed a huge difference after a couple of weeks using Fibre Force. And I’ve definitely saw a dramatic reduction in dry patches on my scalp, largely I think due to the BC Fibre Force Treatment, (£14.45 for 150ml). 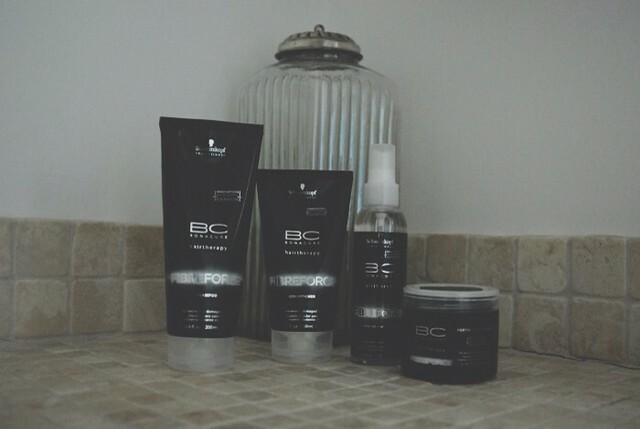 The BC Fibre Force Treatment is a rich hair mask which helps to reform keratin bonds in your hair, effectively restoring each follicle from the inside out by helping to repair and regenerate your hair’s structure. In general, I tend to use masks at least once a month so I assumed that counted as a fairly regular basis. However during my visit to Boilerhouse, Saskia, my stylist for the evening, advised me that I should be using masks on a weekly basis. In all honesty I think that seems like a lot – at the most I probably only ever would get round / bother to use one each fortnight. But I have made more of an attempt to use this treatment. In fact, I’ve got it on right now as I type! Most masks I find can leave your hair a little greasy and weigh it down too much, so usually I prefer how my hair feels on the second wash after the treatment. However, when combined with the shampoo and conditioner, the treatment still leaves hair glossy and smooth without appearing greasy. Although I’ve gotten a lot of use out of the other products, I’ve shied away from the BC Fibre Force Fortifier Spray Conditioner (£12.75 for 150ml), a little. It’s a leave in conditioner which helps to detangle hair but is more designed for very damaged hair. Again the product is designed to restore your hair’s keratine bonds and help seal follicles for an ultra shiny look. However, I’ve felt this is more of a product for people who have subjected their hair to a lot more damage than mine and it’s a little too much moisturising for a day to day product. It would be ideal though for holiday, and would’ve kept my hair nice and hydrated in Mykonos… shame it hadn’t arrived sooner!